I've made all kinds of lemon tarts before. If you've by chance landed on this blog looking for a lemon tart recipe, please kindly disregard those and fast-forward straight to this guy. Fair warning, this takes a while and may not be for the faint of heart (see the novel-length recipes below); I tried and failed to make it during naptime. It's worth every extra second, though. The end result is the perfect lemon dessert. Velvety, tangy, smooth, and everything a lemon lover could dream of. I'm not a huge shortbread fan and the crust was very shortbread-y, so I might try a different crust recipe next time. 1. Have a thermometer, preferably an instant-read, a strainer and a blender (first choice) or food processor at the ready. Bring a few inches of water to a simmer in a saucepan. 2. Put the sugar and zest in a large heatproof bowl that can be fitted into the pan of simmering water. Off heat, work the sugar and zest together between your fingers until the sugar is moist, grainy and very aromatic. Whisk in the eggs followed by the lemon juice. 3. Fit the bowl into the pan (make certain the water doesn’t touch the bottom of the bowl) and cook, stirring with the whisk as soon as the mixture feels tepid to the touch. You want to cook the cream until it reaches at least 160 degrees F. (If you can get it up to 180 degrees F, which is what professional pastry chefs do, great; if not – don’t worry, it will still thicken.) As you whisk the cream over heat – and you must whisk constantly to keep the eggs from scrambling – you’ll see that the cream will start out light and foamy, then the bubbles will get bigger, and then it will start to thicken and the whisk will leave tracks. Heads up at this point – the tracks mean the cream is almost ready. Don’t stop whisking and don’t stop checking the temperature. And have patience – depending on how much heat you’re giving the cream, getting to temp can take as long as 10 minutes. 4. As soon as you reach the right temperature, pull the cream from the heat and strain it into the container of a blender (or food processor). Let the cream rest at room temperature, stirring occasionally, about 10 minutes. 5. Turn the blender to high and, with the machine going, add about 5 pieces of butter at a time. Scrape down the sides of the container as needed while you’re incorporating the butter. Once the butter is in, keep the machine going – to get the perfect light, airy texture of lemon-cream dreams, you must continue to beat the cream for another 3 minutes. If your machine protests and gets a bit too hot, work in 1-minute intervals, giving the machine a little rest between beats. 6. Pour the cream into a container, press a piece of plastic wrap against the surface to create an airtight seal and chill the cream for at least 4 hours or overnight. When you are ready to construct the tart, just whisk the cream to loosen it and spoon it into the tart shell. 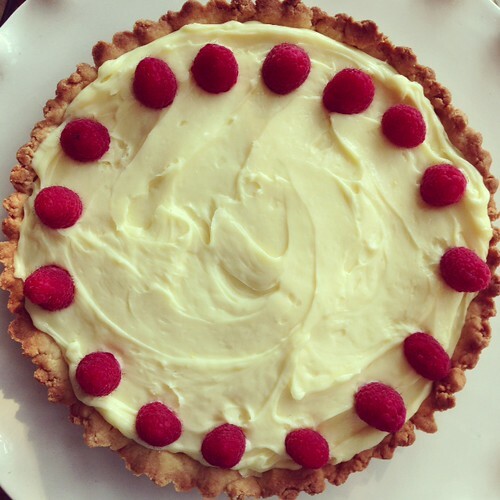 Storing: While you can make the lemon cream ahead (it will keep in the fridge for 4 days and in the freezer for up to 2 months), once the tart is constructed, it’s best to eat it the day it is made. 1. To make the dough: Put the flour, confectioners' sugar and salt in the workbowl of a food processor and pulse a couple of times to combine. Scatter the pieces of butter over the dry ingredients and pulse until the butter is cut in coarsely - you'll have pieces the size of oatmeal flakes and pea-size pieces and that's just fine. Stir the egg, just to break it up, and add it a little at a time, pulsing after each addition. When the egg is in, process in long pulses - about 10 seconds each - until the dough, which will look granular soon after the egg is added, forms clumps and curds. Just before your reaches this clumpy stage, the sound of the machine working the dough will change - heads up. Turn the dough out onto a work surface. 2. Very lightly and sparingly knead the dough just to incorporate any dry ingredients that might have escaped mixing. 3. Butter a 9-inch fluted tart pan and press the dough evenly along the bottom and up the sides of the pan. Don't be stingy - you want a crust with a little heft because you want to be able to both taste and feel it. Also, don't be too heavy-handed - you want to press the crust in so that the pieces cling to one another and knit together when baked, but you don't want to press so hard that the crust loses its crumbly shortbreadish texture. Freeze the crust for at least 30 minutes, preferably longer, before baking. I Love your beautiful stories, stunning photographs and mouthwatering creative recipes! Thanks for sharing Great recipe ideas. I love this article. Great foods!! Thank you so much for sharing these, we are truly inspired!!! We would like to add your blog to the Top Food Blog list in www.mytaste.com/ with over 7 million users worldwide... Your blog is impressively BEAUTIFUL and deserves to be included on the Top list!! We will feature your blog and create shout outs about your recipes to our fan pages. MyTaste is a social platform for foodies and blogs/sites owners like you and it helps to reach more people, get more visibility from the web and share/save foods and recipes. Some of them receive at least 10,000 visits from us on a weekly basis. This one looks so easy to make! I can't wait to try it! The colors are so appetizing, too! I loved the lemon cream tart! It was simply delicious. Followed the recipe exactly. Watch the crust so it does not get too brown - mine was done a few minutes before the suggested baking time. I also put a foil ring over it for the second baking with the filling. I had no problem with sticking - just used parchment paper in the pan.